Technician Chinnayah Ponnusamy has been getting his eyes checked at a polyclinic close to home since early this month, saving him the trouble of going to a hospital. The move is part of a nationwide effort to step up eye care in the community and save patients a trip to specialist outpatient clinics in hospitals. Six primary-care facilities - including Hougang Polyclinic, where Mr Chinnayah has been seeking care - have been chosen for the initiative. "It's more convenient for me, because it's near my place," said the 59-year-old, who has moderate diabetic retinopathy. The condition, which causes blurred vision and can result in blindness if not managed properly, is caused by diabetes. "The service is good and the waiting time is not as long," said Mr Chinnayah, who lives in Serangoon North, adding that he used to visit Tan Tock Seng Hospital. Associate Professor Wong Hon Tym told a media briefing on Tuesday that the goal is to refer at least 10 per cent of eye cases across all six participating facilities to the new clinics instead of hospitals. Hougang Polyclinic alone made 2,700 hospital referrals for eye conditions last year. Patients referred to the new eye clinics would typically have conditions that require specialised equipment or more care. "For example, people with moderate cataracts that would cause mild blurred vision," said Prof Wong, who is medical director of the National Healthcare Group Eye Institute. "These people are starting to have some problems, but are still coping very well." Complex or urgent cases will still be referred to hospital specialists. 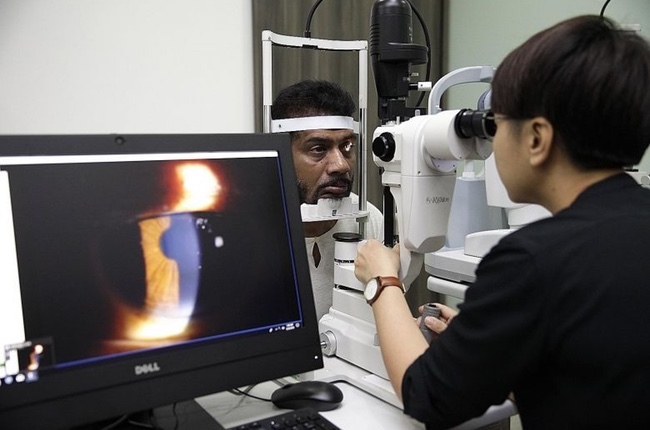 Hougang Polyclinic's eye clinic is being run by optometrists qualified to diagnose and manage such diseases and supervised by resident physicians for the first three years. It conducts five half-day sessions a week and will eventually scale this up to 10 sessions a week. Another facility is being run at Keat Hong Family Medicine Clinic as part of a partnership with the National University Hospital (NUH). "Community eye clinics are located in the heartland and will focus on diagnosing, treating and monitoring patients with stable and non-complex eye problems," said Associate Professor Clement Tan, who heads the eye surgery centre at NUH. "We hope that the clinics will bolster the provision of primary care to the community and bring about savings in time and healthcare costs for patients." The other four facilities chosen are Pioneer, Geylang and Punggol polyclinics and the Health Promotion Board.